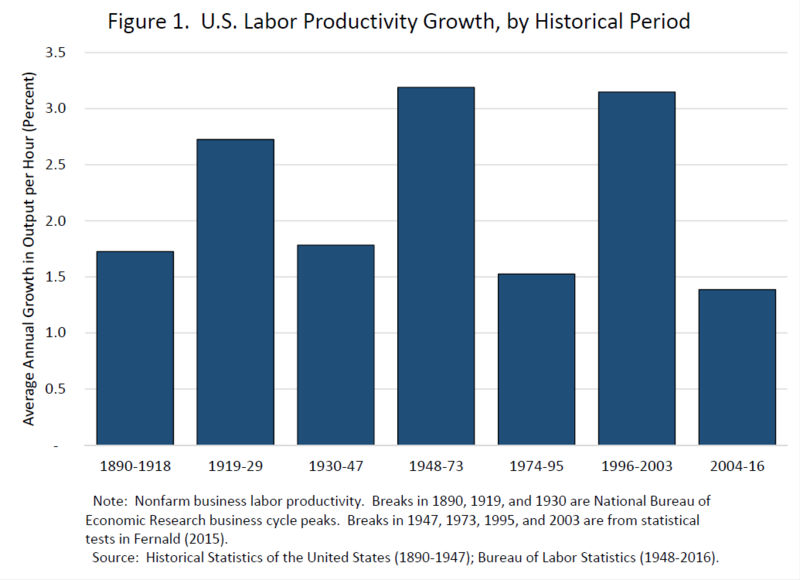 Labor productivity growth varies a lot from year to year, but it is possible to discern longer historical periods with high or low productivity growth, as shown in figure 1. For example, labor productivity rose at an average annual rate of 3-1/4 percent from 1948 to 1973, whereas in the period 1974 to 2016, the average growth rate of productivity was about 1.7 percent. That is to say that, with the important exception of the information technology (IT) boom beginning in the mid-1990s, the U.S. economy has been in a low-productivity growth period since 1974. The record for the past five years has been particularly dismal. How much does productivity growth matter? A great deal. The person who made that clear, in an article published in 1957, 60 years ago, Professor Robert Solow, is here tonight. That is a pleasure, an honor, a joy, and something of a difficulty for anyone wanting to talk about productivity and its growth in the presence of the master. The reason the rate of productivity growth matters so much is that it is a basic determinant of the rate of growth of average income per capita over long periods.2 To understand that one needs to know only the trick of calculating how long it takes for a growing economy to double. A good rule of thumb for calculating the time it takes labor productivity (or anything else that is growing) to double can be calculated by dividing 70 by the growth rate. When labor productivity was growing at 3-1/4 percent per year--during the 25 years from 1948 to 1973--it took 22 years for labor productivity to double. Looking again at Figure 1, in the 42 years from 1974 to 2016, when labor productivity was growing on average at a rate of 1-3/4 percent, it would have taken approximately 41 years for labor productivity to double. There is a vast difference between the prospects facing the young in an economy where incomes per capita are doubling every 22 years and an economy in which incomes are on average doubling only every 41 years. Now, productivity statistics are imperfect in many respects--for example, capturing the value of the seemingly free apps we use on our smartphones is challenging. And many of us who live in the modern age cannot believe that the iPhone has not fundamentally changed our lives. It has certainly changed our lives to some extent, and there is likely some underestimation of productivity growth in the official data. But to figure out whether the current degree of data bias has reduced estimated growth, we have to ask not whether there is bias, but whether the bias has increased. To a first approximation, one could assume that the rate of bias is constant, and does not account for the estimated decline in productivity growth and that we should not dismiss the slowdown as an artifact of measurement difficulties3 That is the conclusion most researchers reach, but the data issue is not settled. As Bob Solow famously said, just before the increase in productivity growth of 1996-2003, "the computer is everywhere except in the growth data." And there are serious researchers who have made serious arguments that we will soon be seeing more rapid growth in the productivity data. Clearly, a key question for economic forecasters, and even more so for U.S. citizens, and indeed for the entire global economy, is whether we should anticipate a return of the more rapid productivity gains experienced in the IT boom and for the quarter century after the end of World War II, or should instead resign ourselves to tepid economic growth in future years. And a central policy issue is whether government policies can help push the economy toward a higher-productivity regime. 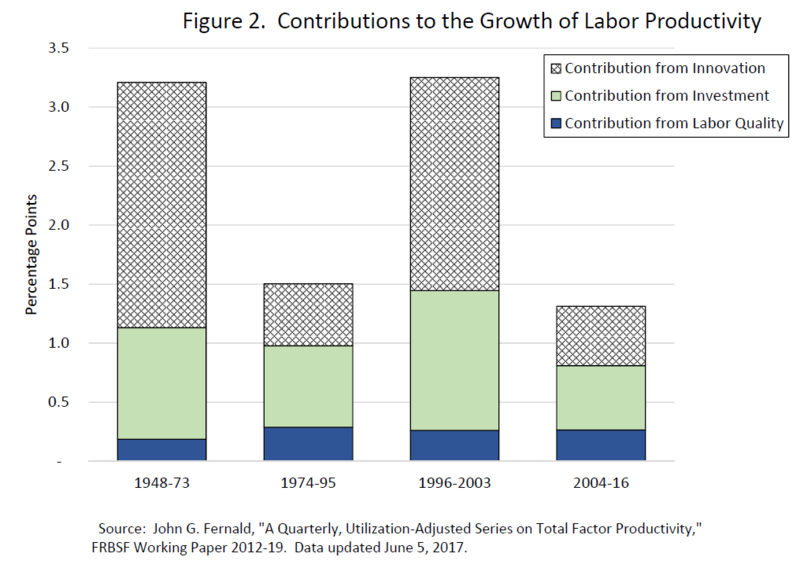 In this context, it is useful to think of labor productivity growth as coming from three sources, as shown in figure 2. First, greater investment by firms in tangible equipment and structures, as well as "intangible" investments such as software and product designs, raise labor productivity. Second, improvements in labor quality, or the capabilities of the workforce, contribute as well--through education, training, and experience. Finally, innovations yield more or better output from the same inputs--the same capital and labor--such as the introduction of the assembly line and computer-aided product design. I will consider the role that policy may play through each of these channels. It is noteworthy that most of the recent drop in productivity is due to a lower contribution from innovation, although weaker investment has played a role as well. The contribution to labor productivity from labor quality has changed very little. One way to ensure the vigor of innovation is to support research and development (R&D), and here the recent record is mixed. 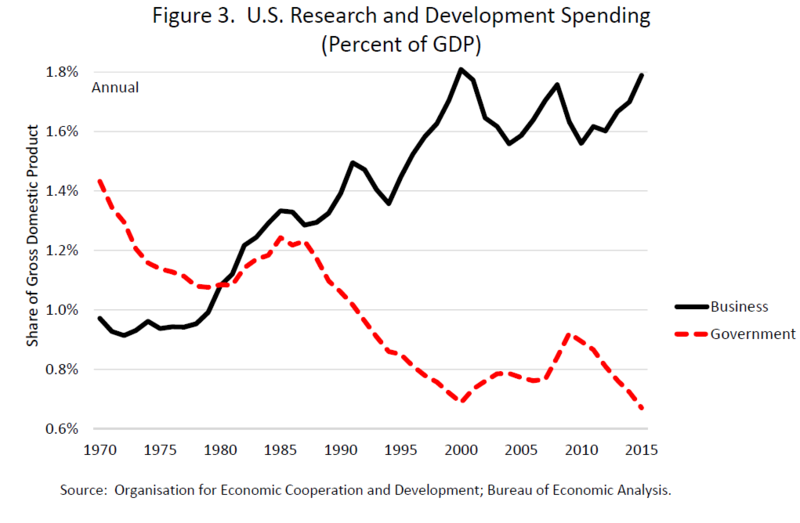 As shown in figure 3, R&D spending in the United States softened during the Great Recession. R&D funded by U.S. businesses has since recovered. However, government-funded R&D as a share of gross domestic product is at the lowest level in recent history. A great deal of the "R" in overall R&D is government funded and not tied to a specific commercial goal. The applied research built on this basic research ultimately yields productivity gains far into the future.7 Consequently, the decline in government-funded R&D is disturbing. It is difficult to pinpoint specific policy actions that would address this decline in dynamism. Broadly speaking, however, government policymakers should carefully consider the effects of regulations and tax policy on the free flow of workers, capital, and ideas. In recent years, the contribution to labor productivity growth from investment has declined. Business fixed investment rose roughly 2-1/2 percent per year, on average, from 2004 to 2016, compared with about 5 percent from 1996 to 2003.9 Some bright spots do exist: Capital expenditure by leading IT companies--Google, Amazon, and the like--has soared since 2010, and investment in the energy sector has returned to life. Nevertheless, firms as a whole seem reluctant to invest. This cautious approach to investment may in part reflect uncertainty about the policy environment. By one measure, U.S. policy uncertainty was elevated for much of the recovery, subsided in 2013, and then rose again late last year, underpinned by uncertainty about policies associated with health care, regulation, taxes, and trade.10 Reasonable people can disagree about the right way forward on each of those issues, but mitigating the damping effect of uncertainty by providing more clarity on the future direction of government policy is highly desirable--particularly if the direction of policy itself is desirable. Government investment can be an important source of productivity growth as well. For example, the interstate highway system is credited with boosting productivity in the 1950s and 1960s.11 That highway system and many other federally supported roadways, waterways, and structures have been neglected in recent years. Indeed, real infrastructure spending (that is, adjusting for inflation) has fallen nearly 1 percent per year since 2005.12 This area of government investment deserves more attention. Also important to raising labor productivity is investment in human capital--workers' knowledge and skills. Such investment is a particular issue because most forecasts anticipate that the long rise in educational attainment--both for college and high school--may soon come to an end. One area where policy may play a role is promoting educational access and readiness for groups for whom educational attainment is relatively low. Lastly, I will note that ultimately the return on the human capital embodied in our workforce is closely tied to public health. A rise in morbidity or fall in longevity in the U.S. population is not a concern only for humanitarian reasons. Workers too ill to perform at their potential represent lost productivity and welfare for society as a whole. Research has shown just such a trend among prime-age non-Hispanic Americans without a college degree.15 More study is needed to determine what policies would help reverse this trend, and government funding could likely assist the effort. More broadly, programs to promote clean air and drinking water are examples of public health policies that bolster the health and longevity of the present and future workforce as a whole. But fortunately, when it comes to productivity, we are not simply consigned to luck or to fate. Governments can take sensible actions to promote more rapid productivity growth. Broadly speaking, government policy works best when it can address a need that the private sector neglects, including investment in basic research, infrastructure, early childhood education, schooling, and public health. Reasonable people can disagree about the right way forward, but if we as a society are to succeed, we need to follow policies that will support and advance productivity growth. That is easier said than done. But it can be done.